In recent years, the half dollar has all but disappeared from the channels of U.S. commerce, becoming almost irrelevant to the nation's coinage system. That's a far cry from the role it played in America's formative years, when it had a significant function and carried exceptional weight. 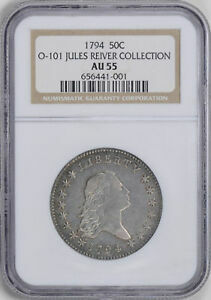 Its importance was underscored by the fact that in 1794, when U.S. silver coinage began, the half dollar was one of the first three denominations to be issued in that metal, along with the silver dollar and half dime. Coinage in general was slow to get under way at the nation's first mint in Philadelphia. Congress passed the law authorizing the U.S. Mint and spelling out coin denominations and specifications on April 2, 1792 but the first copper coins didn't go into production until 1793, and more than two full years went by before the first silver coins emerged. Part of the delay resulted from complications inherent in setting up a new mint. But, to a great extent, precious metal coinage was stymied by red tape of the government's own devising. In establishing the Mint, Congress had decreed that two key technical officers, the chief coiner and assayer, would have to post bonds of $10,000 apiece before they could work with gold and silver. The intent of this was laudable: to protect the American people from malfeasance. The effect, however, was crippling: The designated officers couldn't come up with the money, an enormous sum by 18th-century standards, so only copper coinage could proceed. Congress relented at length, lowering the bonds to more manageable levels, but only after Mint Director David Rittenhouse secured the intervention of Secretary of State Thomas Jefferson, the Cabinet officer then in charge of the Mint. Chief Coiner Henry Voigt and Assayer Albion Cox thereupon posted their bonds of $5,000 and $1,000, respectively, and precious-metal coinage got under way. The dollar was the first silver coin to be produced; being the largest and having the highest face value, it was looked upon as possessing the most prestige, something the infant nation sorely needed. But while the silver dollar may have burnished America's image, it did little to provide an immediate solution to the nation's coinage needs: The coining press couldn't cope with its size and heft and broke down after fewer than 1,800 satisfactory pieces had been struck. Rittenhouse decided to suspend dollar coinage until a better press could be installed, a delay that would prove to be more than six months long. Meanwhile, however, pressure built from depositors who had left silver bullion with the government, expecting silver coinage in return. To meet this demand, the Mint began producing half dollars, delivering the first shipment of approximately 5,300 pieces on Dec. 1, 1794. Thus did the two largest U.S. silver coins assume at the very outset the relative roles they would play for over a century: the dollar as a showpiece and the half dollar as a workhorse. While their roles may have been different, the 1794 dollar and half dollar and, for that matter, the first half dime as well were identical in design. Congress had specified that the silver coins should carry a design "emblematic of Liberty," and Mint engraver Robert Scot had implemented this mandate with a right-facing portrait of a youthful female figure whose hair flowed freely behind her, hence the descriptive term "Flowing Hair." It's said the flowing hair was meant to signify freedom. LIBERTY appears above the portrait, with the date below and 15 stars along the sides, denoting the number of states in the Union at that time. Scot's model for the obverse was a pattern 25 cent piece of 1792 designed by Joseph Wright, a Mint engraver who died of yellow fever in 1793. The coins' reverse depicts a small, spread-winged eagle perched upon a rock and surrounded by laurel branches. Along the border, encircling this, is the motto UNITED STATES OF AMERICA. The half dollar's edge bears the inscription FIFTY CENTS OR HALF A Dollar, with decorations between the words. After completing the first production run of Flowing Hair half dollars, the Mint was poised to make more. But its rolling equipment broke down, so it couldn't flatten ingots to the proper thickness for coin blanks. 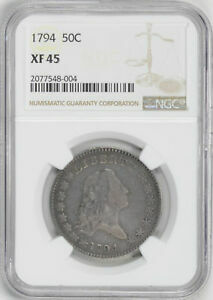 Repairs took several weeks, and as 1794 drew to a close the Mint had at least six obverse dies on hand with that date. 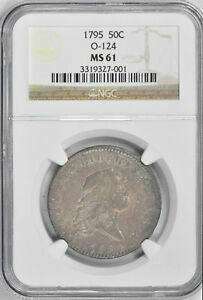 Rather than scrap them, it kept making 1794 half dollars in 1795. 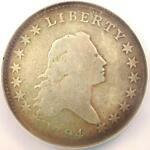 Only when all the 1794 dies became unusable did it start using dies dated 1795. The Mint produced 23,464 half dollars dated 1794 and 299,680 dated 1795. It replaced the obverse in 1796 with the Draped Bust portrait of Liberty, making the Flowing Hair version a two-year type coin. 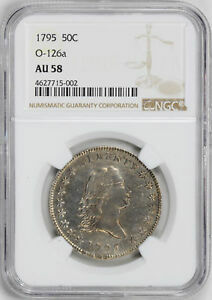 Some 1795 half dollars have a recut date, but these are not unduly elusive. Some 1795 pieces have three leaves under each of the eagle's wings, instead of the normal two, and these are scarce. No proofs are known for this series, which is widely collected by type. Points to check for wear are the hair above and beside Liberty's forehead and the center of the eagle's breast. Flowing Hair half dollars are slightly larger and heavier than their modern counterparts. Their authorized fineness is marginally lower, but their actual fineness is virtually the same, and thereby hangs a tale. Congress had specified an unusual alloy of 1485/1664 silver and 179/1664 copper, for a fineness of .8924+. But Assayer Cox complained that this was unworkable, and made the bizarre claim that silver coins would blacken in ordinary use unless they were at least .900 fine. He induced Director Rittenhouse to let him use the higher standard, even though Congress hadn't sanctioned it, meaning the Mint was breaking the law of the land. This led to substantial losses for people who deposited bullion with the Mint and took silver coins in return, for they had to give more silver per coin than the law required. 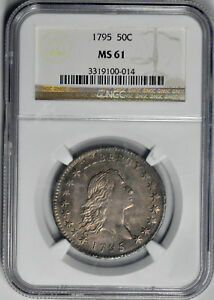 Apparently, most Flowing Hair half dollars went right into commercial use. While readily available in circulated condition, they are virtually unobtainable in high Mint-State grades. Overton, Al C., Early Half Dollar Die Varieties 1794-1836, Third Edition, edited by Donald Parsley, Escondido, CA, 1990.